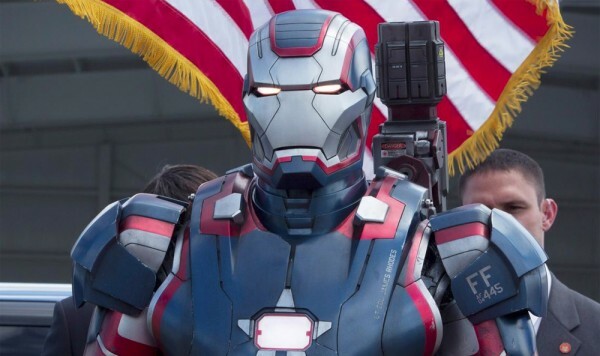 Iron Man 3 sees a changing of the guard in terms of both writers and director from Iron Man and Iron Man 2 with Shane Black now directing and co-writing with Drew Pearce. The change up from the Jon Favreau lead first two instalments work in the post The Avengers era that Tony Stark (Robert Downey Jr) finds himself. Referred to as 'What happened in New York' Iron Man 3 finds Tony dealing with the affect The Avengers events has had on him. Unable to sleep Tony has thrown himself even further into tinkering with the Iron Man suits. His absorption into work is affecting his relationship with Pepper Potts (Gwyneth Paltrow) who now takes a more central position in the film. The big external threat comes not from extraterrestrials, but from Earth bound terrorism in the shape of The Mandarin (Ben Kingsley). Don Cheadle returns as James Rhodes/War Machine with Guy Pearce as Aldrich Killian and Rebecca Hall as Maya Hansen adding to the impressive cast. Though a Christmas setting is a hallmark of Shane Black films, it does seem a little redundant for an Iron Man film. However, Black has taken on board the events of The Avengers and has taken an interesting angle on Tony in terms of deconstructing his superhero persona with whippet fast dialogue and never skimming on blockbuster action. Robert Downey Jr. is on fine charismatic form and remains the clear character driven centre of the franchise. There are Black influences throughout the film, from the Christmas setting to the laudable but loyal friend Happy Hogan; smart fast throwaway lines, (Jon Favreau) and a Lethal Weapon 2-esque dock set finale. Paltrow's Pepper is given far more to do in terms of action, though Rebecca Hall's character coming from Tony's past is somewhat a waste of Hall's considerable talents but does help to propel the story. Guy Pearce is on fine form with a wardrobe that hints at his off centre intentions and rivals Downey Jr. for screen presence. Though there is a predictable All American interest in the USA president it allows Don Cheadle as War Machine to be rebranded as Iron Patriot and to clearly enjoy his on and off screen friendship with Downey Jr. With plot twists and reveals that one would be hard pressed not to figure out within the first 5 minutes of the film, Iron Man 3 stands firmly and successfully on it's dialogue and Downey Jr.'s ability to flip between cocky and vulnerable on a pin while still understanding the need for a Marvel film spectacle. Arguably less layered and more predictable than Joss Whedon's The Avengers, Iron Man 3 is still a fine instalment in the Marvel canon and worth enjoying at a cinema to really feel the full effects of this smart, adult aimed superhero film.